Mukherjee entered Parliament for the first time 48 years ago at the age of 34 in July 1969 as a member of the Rajya Sabha. 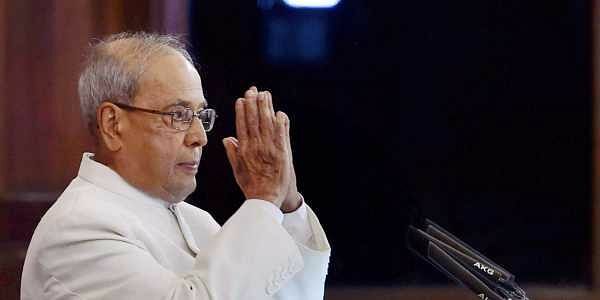 NEW DELHI: Members of Parliament on Sunday bid adieu to outgoing President Pranab Mukherjee at a gala ceremony in the Central Hall as leaders across the political spectrum recalled his contribution in upholding democratic values. Eighty one-year-old Mukherjee was received by Vice President Hamid Ansari, Prime Minister Narendra Modi, Lok Sabha Speaker Sumitra Mahajan and Parliamentary Affairs Minister Ananth Kumar at the Parliament for the farewell ceremony. In her speech, Mahajan said, “This is a solemn occasion for each one of us to express our profound respect to President Mukherjee.” Ansari on his part lauded Mukherjee for his “unshakable belief in the idea of India” and said he often appealed to the people to re-dedicate themselves to the democratic values of the country. Stating that the government should avoid the Ordinance route, he said, “The Ordinance route should be used only in comp­elling circumstances and there should be no recourse to Ordinances on monetary matters. Ordinance route should not be taken on matters which are being considered or have been introduced in the House or a committee of the House. If a matter is deemed urgent, the concerned committee should be made aware of the situation and be mandated to present its report. Mukherjee entered Parliament for the first time 48 years ago at the age of 34 in July 1969 as a member of the Rajya Sabha. He served as a Member of Lok Sabha and Rajya Sabha for 37 years. He represented the Rajya Sabha for five terms and two terms in the Lok Sabha.